As a family-owned business, we take great pride in the work we do for you, whether you're a residential or a corporate client. Super Construction has been providing quality excavation services for more than 30 years. 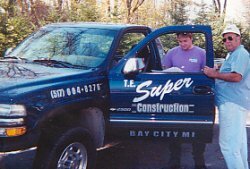 Super Construction has been Excavating & Contracting In Michigan, producing excellent service and quality for 30 years. We offer quality underground excavation, and Directional Boring / Drilling, to sites within the Bay City, Saginaw, and Midland area, as well as in cities throughout Michigan, Indiana and Ohio.